Adult acne is a b*^$h! Seriously, though, weren’t we supposed to grow out of our breakouts by now? Truth is, acne can actually get worse as we get older. Like milia, the tiny whiteheads that can form around the eyes and on the forehead, these stubborn suckers can double – even triple – as you get into your late thirties / early forties. Awesome, right? BRUTAL. And the products we used and loved in our teens can actually make our adult acne worse. Like those full-on salicylic acid products? And benzyl peroxide? Harsh ingredients are okay in small amounts, but in anti-acne formulations they can actually sensitize the complexion, stripping the skin of natural oils, making oil glands secrete more sebum which just freaks out the face. And the vicious cycle continues. Of course, it’s different for everyone — and what works for me may not work for you — but I can say, unequivocally, that the number one thing that’s helped curb my adult acne is using less of the harsh ingredients – I still use them, but in smaller dosages and layered with healthy, non-comedogenic hydrators – and more of the loving ones. Tata Harper Clarifying Cleanser ($68) – I love this cleanser because it treats acne, but it does so very gently. Meaning: it’s not stripping my skin or creating one of those vicious cycles of drying it out to the point of a freak out. Chlorella is added to soothe redness and irritation, without causing additional breakouts. It’s like a sensitive skin-slash-acne cleanser combo. Whamisa By Glow Recipe Green Tea Serum Toner ($22) – I’m obsessed with K-beauty, and this serum-toner hybrid is a Korean skincare staple. It soothes and hydrates, while providing antioxidant (a.k.a. aging) benefits. Green tea is an amazing anti-inflammartory ingredient that helps acne while also aiding in preventing fine lines and wrinkles. The watery texture leaves my skin glowing… and when I’m having a seriously oily moment, this is enough moisture for my complexion. REN Clarimatte T-Zone Balancing Gel Cream ($52) – I’m super into gel-creams, especially as we inch into spring and summer. This formula is lightweight but loaded with ingredients that help curb oil production while also reducing shininess. If your skin is on the oilier side, this is a fantastic pre-makeup cream (it leaves skin with a matte finish). Sanitas Skincare Oil Free Moisturizer ($36) – When my skin is in super freakout mode, I like to keep my routine simple: no active ingredients. Sanitas’s oil-free moisturizer has been a staple on my shelf for quite some time: it does a great job hydrating without any irritants or oils… yes, there are certain oils that do benefit oily skin, but sometimes I don’t want to take that chance, so I stick to oil-free for my sanity. 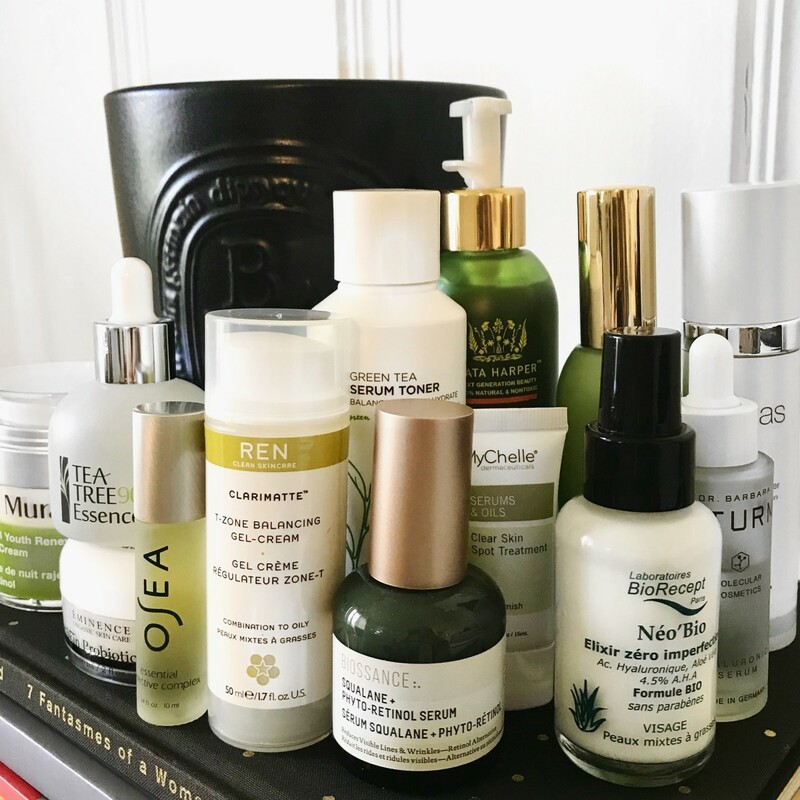 Biossance Squalane + Phyto-Retinol Serum ($78) – This is a new recruit, and I did a ton of ingredient research before using. Squalane is a great hydrator for sensitive, oily skin, but retinol can be tricky. Not this one: bakuchiol is the source of retinol – and that’s a plant – so you get decent benefits without any irritation. It’s definitely not as strong as a more active retinoid, but eat least I know it’ll give me a glow without any chance of irritation. Eminence Organic Skin Care Clear Skin Probiotic Masque ($54) – This mask is more creamy than clay, but I find it soothing on irritated, acne-prone skin. Yogurt is a natural lactic acid, which sheds dead skin and brightens the appearance while also soothing any irritation, and tea tree oil aids in eliminating acne-causing gunk. All of the ingredients are skin-loving and anti-acne. Osea Essential Corrective Complex ($36) – I love the care that’s put into creating this line — and the ingredients they choose are truly healthy. This is not for the faint of oils — it’s an oil tonic that rolls on to fight infection, bacteria, and congestion. Using oils to treat acne may seem counterintuitive, and it’s definitely not for everyone, but if you’re looking to feed your face natural ingredients that will, in the long run, keep skin clear and clean, use this roll-on as your new blemish blaster. Of course, I still do use my End Zit ($20) on the daily — sometimes you just need something a bit stronger, and that’s okay too. Since the trick is to not over-dry, it’s beneficial to have options and alternatives. MyChelle Clear Skin Spot Treatment ($18) – Spot treat blemishes with this all-natural remedy of sulfur, zinc, and willow bark. As far as healthy acne treatments go, this stuff is legit. Dr. Barbara Sturm Hyaluronic Serum ($300) – This stuff is expensive, but it’s a necessity. Sure you can find cheaper hyaluronic acid serums, but this one is the best I’ve tried — and worth every penny (Dr. Sturm uses with long- and short-chain hyaluronic molecules, which deliver far better results, and faster). It hydrates, soothes, plumps fine lines, and doesn’t irritate or cause acne. Plus, since every single skin type needs hydration, and hyaluronic acid is literally the best hydrator on the market, every single person — including us adult acne sufferers – should have a soothing serum in the skincare repertoire to counteract the drying effects of serious acne topical treatments. BioRecept Neobio ($68) – I’m obsessed with this French skincare line (read my exclusive interview with the founder here), and this serum-slash-cream is ideal for combination and oily skin types. Here’s the deal: it hydrates and soothes while also dealing with acne. Basically, it is an anti-aging and anti-acne elixir, and the “natural acids (blueberry, sugarcane, orange, lemon, and maple) are found in a low-pH formula that renders them particularly effective without sensitizing skin.” In other words: no face freakouts with this miracle serum. I find it gives me enough moisture if I couple it with the hyaluronic acid serum, so I don’t need another moisturizer on top. LEEGEEHAAM Tea Tree 90 Essence ($45) – Tea tree oil is definitely one of the best all-natural anti-acne ingredients, and this gentle serum soothes and hydrates while also working on improving texture and tone. It’s not going to zap that zit, but it will give your complexion a more even skin tone and an overall glow, without causing any breakouts.